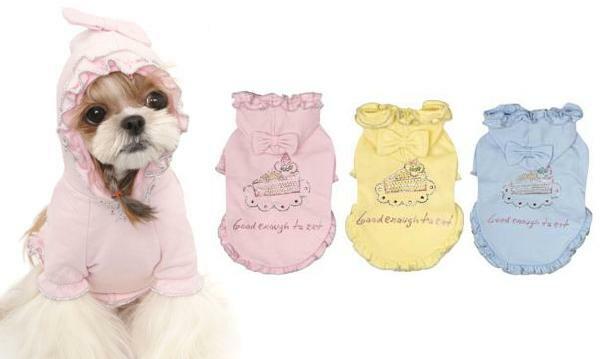 Sweet and Sassy, the Puppy Angel Strawberry Cheesecake Dog Hoodie is great for night, day, inside or out! Made from pure cotton, the hood, sleeves and back are ruched around the edges and trimmed with silver thread. There is a slice of cake decorating the back in small rhinestones with the words 'good enough to eat' beneath them. There is also a cute bow on the hood making this hoodie a real treat for any pampered pet!